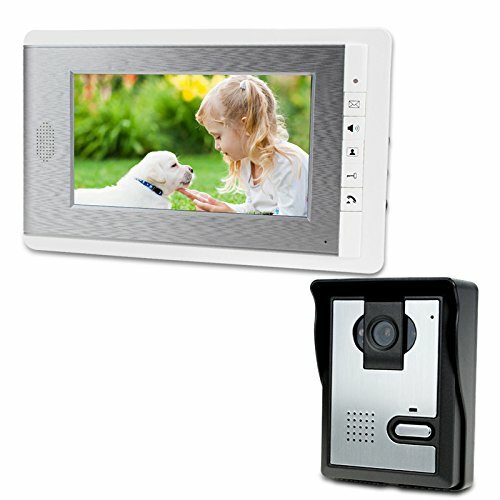 - Security Through Vision - The indoor 7-inch color monitor and outdoor doorbell with integrated HD video camera ensures you can both see and speak with all visitors. - Infrared LED Night Vision - Provides clear vision of visitors even in the darkness of night. - Support answering, monitoring and unlock, dual-way intercom Mute door intercom with doorbell kits, Easy installation, Surface mounting. - Waterproof and Dustproof: The outdoor camera equip with a waterproof cover, can be used even in very bad weather. - Applications: Wired connection stability clear vision for home security, Can be used in apartments, villas, hotels, offices, public buildings.